Haaretz recently featured a Karaite Jewish wedding in its “Someone Else’s Simcha” series. I have wanted to do a post on Karaite weddings for a while – and this gives me the perfect opportunity. 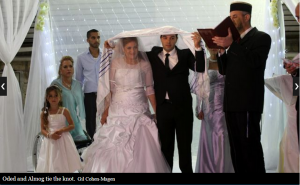 The traditional Karaite Jewish wedding ceremony has several elements that are different from (and sometimes even problematic in) the Rabbinic tradition.